In 2017, the U.S. FDA approved two groundbreaking chimeric antigen receptor (CAR) T-cell therapies – Kymriah and Yescarta – to treat acute lymphoblastic leukemia and diffuse large B-cell lymphoma, respectively. These novel therapies utilize a patient’s own immune cells to attack and kill the cancer, and they have shown promise in treating and, in a few cases, “curing” otherwise incurable hematological malignancies. Capacity constraints: The next CAR-T approval is expected to be for the treatment of relapse and refractory multiple myeloma, a market with an annual incidence of 30,000 new cases every year in the United States alone.5 Approval for multiple myeloma is likely to result in a substantial increase in requirements for CAR-T administration infrastructure, which, if left unaddressed, could provide a substantial drag on commercial performance. Competition among manufacturers: At present, it is unclear if one institute would offer CAR-T therapies from several competitors or if hospitals would have exclusive relationships with a single manufacturer. A preference for exclusivity would be a significant barrier to entry for the new players in the market. Competition from other treatments: Unlike CAR-T 1.0 therapies that were approved for patients with no effective treatment options, CAR-T 2.0 therapies are likely to have effective, branded competitors in the marketplace. For instance, in both multiple myeloma and chronic lymphocytic leukemia, several efficacious and off-the-shelf agents are already approved and readily available. In the absence of head-to-head data demonstrating superiority, CAR-T therapies — with all their attendant challenges — risk being reserved for late-line salvage use. Competition for patients with community oncologists: With multiple myeloma and chronic lymphocytic leukemia patients being effectively treated in the community, at present community providers are likely to compete for patient ownership. Lack of understanding and familiarity with the treatment, site of administration, and toxicity profile are key factors that could inhibit a widespread adoption of CAR-T therapy among community physicians. More payer pushback: Indications like multiple myeloma and chronic lymphocytic leukemia represent much larger patient populations with approved and effective targeted therapies, including some generic ones. As such, CAR-T 2.0 approvals may represent much larger budget impacts than CAR-T 1.0, and they could receive greater payer pushback due to potential restrictions on access and price pressures. Innovators bringing the next generation of CAR-T therapies to market should give heed to and prepare to navigate the challenges identified above. Current and future players must recognize and execute against two key strategic imperatives: 1) optimizing the 360-degree stakeholder experience, and 2) demonstrating clear value through evidence generation. Preemptively addressing these likely future obstacles and opportunities early in the market development process will position CAR-T players well for CAR-T 2.0. To holistically optimize the stakeholder experience, 2.0 innovators must provide effective physician education. Currently, because of the novelty and complexity associated with CAR-T therapies, highly specialized medical experts at selected centers of excellence administer the vast majority of treatments. Indication expansion may lead to capacity issues at these centers, especially because these new indications generally are treated in the community. One strategy to address these concerns is to facilitate CAR-T adoption in the community. However, to successfully drive adoption, it will be critical to effectively educate community physicians on CAR-T toxicity management, as well as on the clinical benefits of CAR-T therapies over other available options. Innovators that anticipate this shift and take measures to help community providers — who already treat nearly 55 percent of all U.S. patients — to adopt their therapies will gain a competitive advantage.6 Players who fail to do so may risk being bypassed by these community providers in favor of other available agents. In other words, educating community oncologists will be a driving factor that determines the success of CAR-T 2.0. While a wholesale move to the community may not be feasible in the near term, an initial shared ownership model is clearly possible. For example, consider this scenario: A center of excellence may require a patient to spend a week at the center to receive the infusion, as well as for immediate post-infusion monitoring, leaving the community physician to own other parts of the CAR-T patient journey. This shared ownership model could drive market success. In addition, this model could provide late entrants with a unique value proposition to differentiate themselves from early entrants that already have strong relationships in place with centers of excellence, for example. With growing competition and a large addressable patient population, companies that can address logistical and manufacturing issues, with robust, simple supply chains, are expected to win in the CAR-T world. In fact, for the first time in the oncology marketplace, logistic strengths can be sources of sustainable competitive advantage. For example, while turnaround time of treatment options is traditionally a minor factor for contemporary care providers, it likely will become a major one for CAR-T 2.0. At present, manufacturing the CAR-T cells through reinfusion can take up to 30 days – that is a long time for a critically ill patient seeking treatment options to wait. In addition, first-wave manufacturers are experiencing product variabilities and capacity constraints. These issues are crippling CAR-T 1.0 adoption and already are giving advantage to innovators with better supply chains. Case in point: Novartis had difficulty manufacturing Kymriah due to unspecified product variabilities, which stalled its European Union launch, allowing competitor Gilead to be first to market. Multiple CAR-T manufacturers are exploring manufacturing enhancements and alternative supply chain structures. Some of the approaches include increased automation and moving away from centralized to point-of-care manufacturing. If CAR-T 2.0 manufacturers do not address these manufacturing, production, and supply chain issues, they might find themselves left behind, as patients opt for conventional treatments dispensed in real time and competitors with robust systems in place gain preference. In addition, CAR-T 2.0 manufacturers might find themselves left behind if they ignore the likelihood that hospitals will face disruptions to standard operating procedures across a number of factors, including patient selection, workup, scheduling, admission, care support, discharge planning, and follow up. Manufacturers that conduct provider impact analyses to help hospitals effectively onboard and scale procedures and best practices will have the advantage. First, there will be more competition within CAR-T 2.0 therapy, so 2.0 innovators will have to find a path to coverage and reimbursement and do so while positioning themselves against similar treatments and standards of care options. Manufacturers should prioritize payers as well as regulatory considerations when designing trials and focus on payer-relevant endpoints, such as overall survival in early-stage clinical trials. A properly planned trial with early inclusion of payer-relevant endpoints could eventually lead to mature and robust data by launch, making payers more comfortable covering these expensive therapies. Proactively addressing reimbursement issues, especially in the context of new “shared ownership” models, also will be critical to CAR-T 2.0 success. Furthermore, as payers get actively involved in managing future CAR-T therapies, manufacturers should start thinking of innovative contracting options, such as performance-based payments, annuity payments, installment payment plans, or risk-sharing agreements to get payer coverage. Innovative payment methods in which cost is related to performance likely will be a way to win in the future. With the large price tag associated with CAR-T therapies and with advancements in conventional therapies, CAR-T therapies need to demonstrate a clear value proposition through the demonstration of clinical benefit over conventional therapies. In the absence of clear clinical benefit, providers will have little motivation to move from a familiar standard of care to a new, unfamiliar one. For example, to date, initial objective response rate data for CAR-T treatment of relapsed and refractory multiple myeloma is compelling. However, durability of responses remains unknown, as follow-up data is limited. Furthermore, even if CAR-T therapy for multiple myeloma is very effective, multiple conventional therapies with high success rates also are available. For example, recently daratumumab in combination with Velcade melphalan-prednisone (VMP) was approved for newly diagnosed multiple myeloma patients who are ineligible for autologous stem cell transplant (ASCT). The approval was based on a 90 percent objective response rate in the daratumumab arm compared to the control arm of VMP.8 Now that an effective therapy for newly diagnosed multiple myeloma patients who are ineligible for regenerative ASCT exists, the entry bar for CAR-T therapies will rise for these patients, and endpoints that measure durability of response, such as progression-free survival and overall survival, will be emphasized. For CAR-T 2.0 markets like multiple myeloma, head-to-head trials to evaluate and demonstrate clinical superiority over on-market therapies will be important validation. With the costs of frontline multiple myeloma triplets and quadruplets likely to be in the $300,000 to $500,000 range,9 CAR-T therapies demonstrating improvements over the competition in earlier lines of therapies will help CAR-T 2.0 therapies gain preferential access. CAR-T 1.0 therapies entered a market that was unprepared for their novelty. 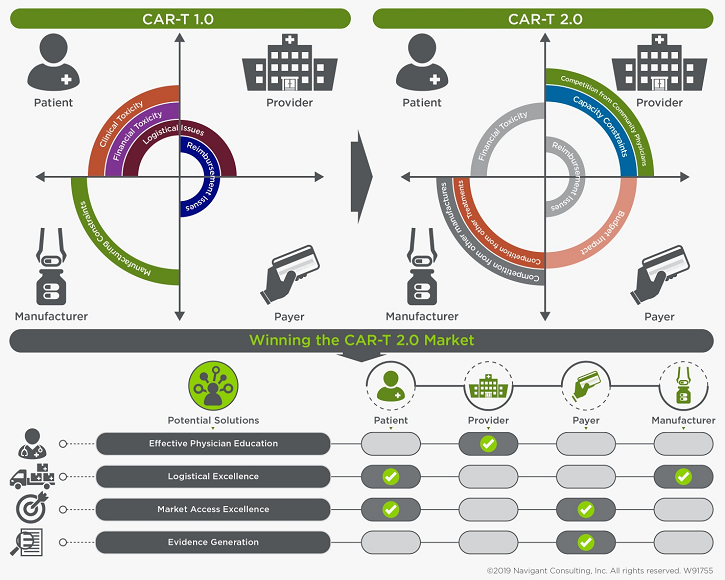 CAR-T 2.0 innovators, being next in line, should take the opportunity to learn from the struggles of their novel predecessors, anticipate new and unique high-stakes challenges, and execute on a thoughtful strategy, to help fulfill the tremendous promise of these revolutionary therapies. Rinki Kapoor is a senior consultant in Navigant’s Life Sciences practice. She has over 10 years of experience in R&D in diverse disease areas including oncology, nephrology, and psychiatry. She also has expertise in cell therapy commercialization, opportunity assessment, market access, disease area strategy, commercial planning, lifecycle management, competitive intelligence, and value messaging. Kapoor earned a Ph.D. in biophysics from Stanford University in California, where she designed novel antibiotics to treat multi-drug resistant bacterial infections and authored several peer-reviewed papers. Tahel Noy is a senior consultant in the Life Sciences Practice at Navigant, where she provides global development strategy, market assessment, and financial modeling for biotechnology and pharmaceutical companies. She has extensive expertise in cellular therapies, including for hematological and solid tumors. Nov earned a Ph.D. from Albert Einstein College of Medicine of Yeshiva University and holds a B.A. and a M.Sc. from the Technion – Israel Institute of Technology. Naval Shanware is an associate director in Navigant’s Life Sciences practice. He provides consulting to clients on a variety of engagements in commercial planning, competitive strategy, portfolio prioritization, and disease area strategy. Shanware has nearly 15 years of experience in the life sciences, including in pharmaceutical R&D. He is a member of the Navigant Oncology Working Group, and holds a Ph.D. in Molecular and Cellular Pharmacology from the University of Wisconsin-Madison.